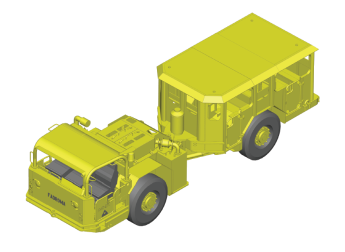 The FADROMA family of utility vehicles SWT-07 and SWR-07 offers a unique versatility for majority of underground mining supporting operations. 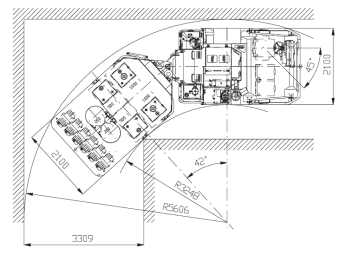 Robust design, high performance, uncompromised safety, outstanding maneuverability, comfort in operator's cabin and low cost of operation are essential features of the presented family of machines. 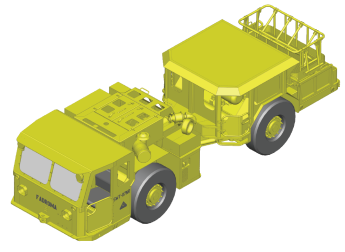 The universal carrier for all vehicles in SWT-07 and SWR-07 family provides an excellent platform for virtually any application. 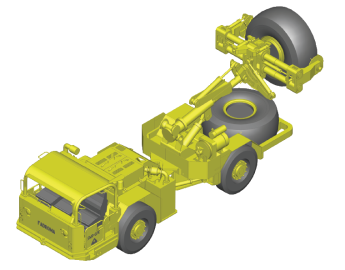 A diesel powered, four wheel driven tractor with articulated frame and robust loading platform allows for high flexibility in installation of various equipment. 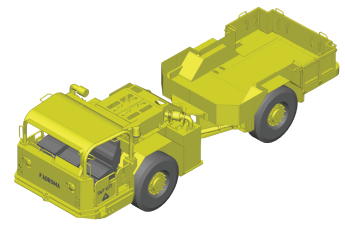 Very high level of parts and components standardization allows for simplifying and speeding up work of mine service units. 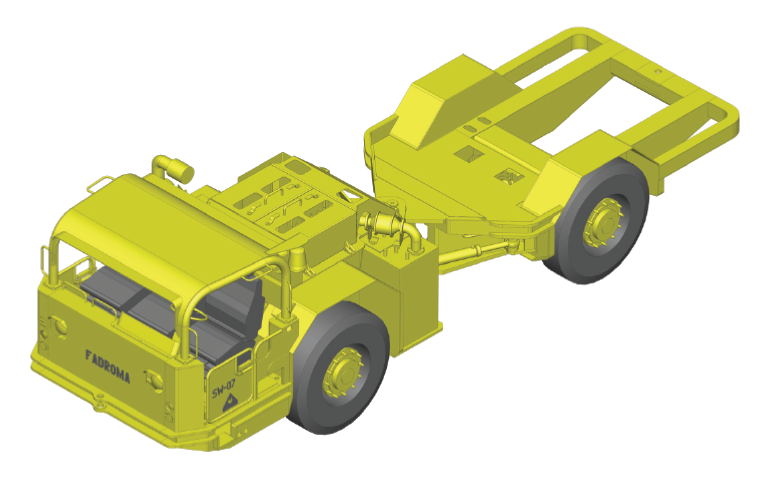 Parts interchangeability among all machines belonging to SWT-07 and SWR-07 familiy provides for lower spare stock levels and better parts availability for service personnel as well as easier and faster maintenance and repair works. This leads eventually to increased savings in machine operating costs due to significantly reduced downtimes and lower investment costs. 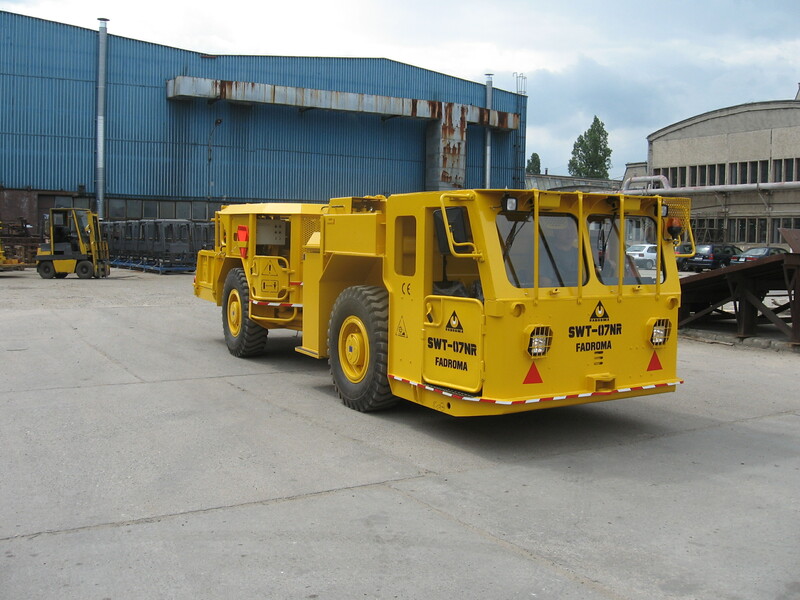 FADROMA offers a broad range of SWT-07 and SWR-07 underground mining utility vehicles. 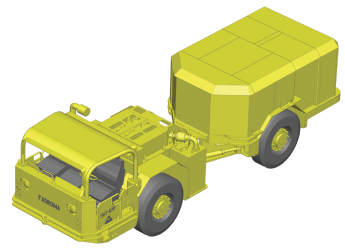 Possible applications include: explosives carriers and explosives charging vehicles, maintenance service vehicles, personnel carriers, transport and service vehicles, wheel changing vehicles etc. 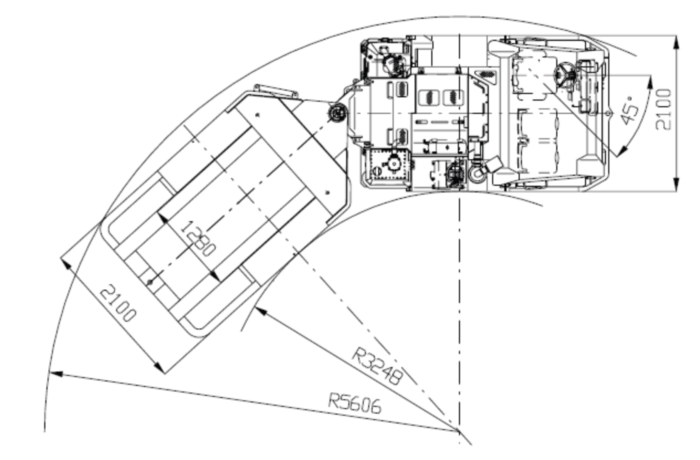 All machines can be equipped with closed cabin, Tier III engines and are available in CE certified versions. 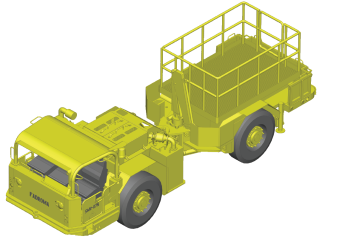 The universal SW-07 heavy duty, robust, diesel powered, four wheel driven carrier with articulated frame and 3 sits operator's cabin prrovides a unique platform for entire SWT-07 and SWR-07 mining utility vehicles range. 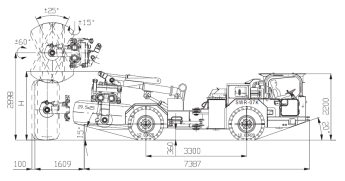 The explosives carrier designed for transporting solid explosives and personnel, with personnel compartment for 3 people and safe explosives compartment with a separate fuse box. 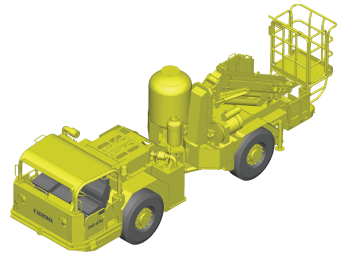 The explosives charging vehicle equipped with the ANFO system, a hydraulically controlled boom with a basket and hydralically powered air compressor. 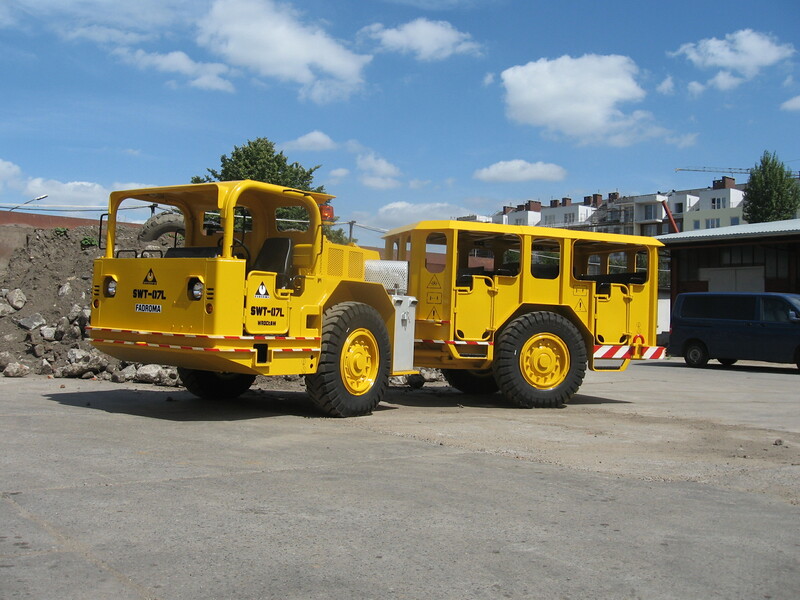 The maintenance service vehicle with 2-6 diesel oil tanks, a grease container, pumps with nozzles for diesels and oils, a sucktion unit for used oil and a grease gun. 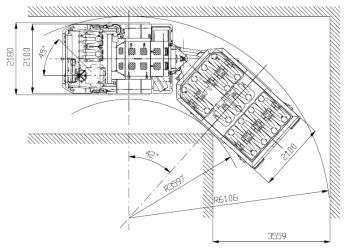 The personnel carrier designed for transporting up to 20 people. 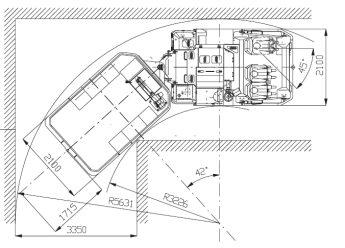 Both the personnel compartment and the operator's cabin are FOPS and ROPS certified for maximum safety. 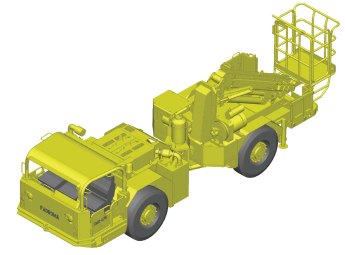 The transport and service vehicle equipped with loading platform for cargo, personnel compartment for 3 people, hydraulic crane, hydraulically powered welder and air compressor. 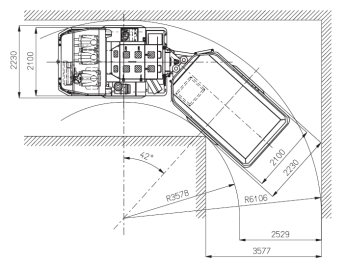 The wheel changing vehicle designed for safe changing of large size and heavy wheels (diameters from 1100 mm up to 2050 mm, weight up to 1300 kg) in underground tunnels. 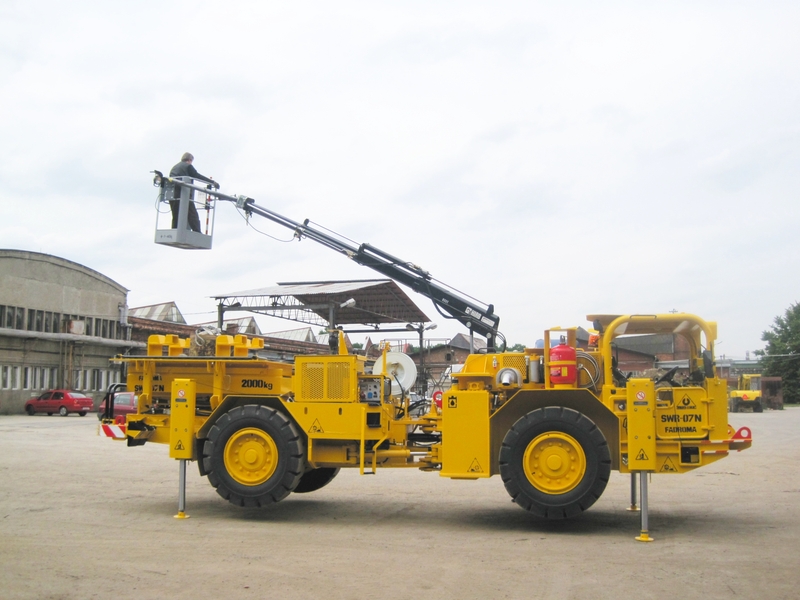 The machine is equipped with a hydraulic boom, sophisticated wheel grasper, air compressor, pneumatic lifting bags for broken machine lifting (up to 67 000 kg) and loading platform for wheel transportation. 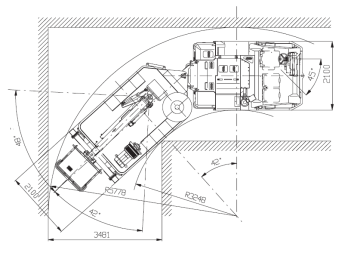 FADROMA's philosophy is based on the belief that customers are faced with specific requirements due to diverse working conditions and therefore require machines characterized by unique technical specification tailored to their particular needs. 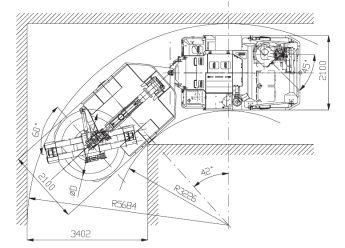 FADROMA's aim is to design and supply mining equipment that is maximally tuned to such specific requirements. 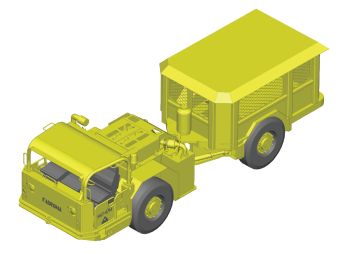 Below, we present more examples of various utility vehicles based on SW-07 carrier. 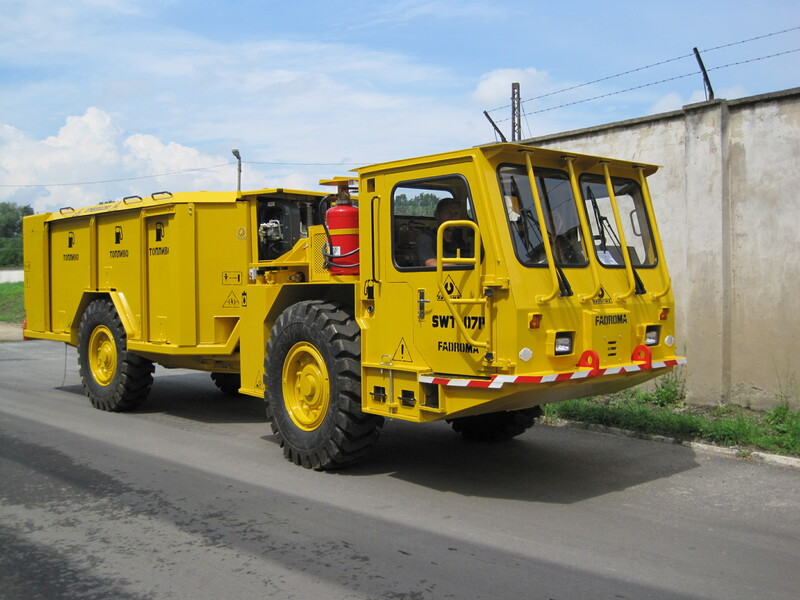 low profile utility vehicle equipped with hydraulically powered welder with generator, hydraulically powered air compressor, compartment for welding gases cylinders and scissors lifting platform.